"It's Myu! I'm Myu! Nice to meet you." "I'm Lucato. Nice to meet you too." And like that, I have managed to call out to Lucato, no, to Luka-chan. "Your Sense build could be changed around a little, but first goes buying a weapon and potions. You start with 1000G, you need to use it on both." Luka-chan was a beginner starting today, so I explained to her about Senses and equipment as I looked around for temporary party's members. "A weapon? I received a weapon upon picking Senses..."
She touched the hilt of a beginner's sword she had by her waist. I already have one, why would I buy another. That's the kind of question she had on her face. "It has its advantages and disadvantages, by buying a new weapon your attack power increases. On the other hand, if you use the initial weapon, it won't break." "So weapons do break, after all." "That's right. But, unless you use them recklessly, it won't be a problem." Luka-chan put a hand on her chin. And, it seemed like she decided what to do. "I think, I'd like to prioritize armour rather than weapon." While talking about various thing with Luka-chan, I walked through the town. About potions having the recovery amount limited by levels and the story about my fails because of it, I spoke of interesting things. Listening to it, Luka-chan seriously worried how much should she purchase. Teaching Lucato bit by bit was so much fun I had forgot about time completely, meanwhile I found a single female player. "Hey, hey, come join our party." "C'mon, it's more fun in a group right. Also, we're strong." "And, you can feel safer with men, too." "See, come with us." I frowned seeing something unpleasant. Four men have surrounded a single girl and solicited her into their party. The girl was older than me, but their solicitation looked like they were just hitting on her. This is a game, I wonder if they're misunderstanding something here. I got angry just by looking. "Luka-chan, I'll go help her out." When I declared that, confused, Luka-chan chased after me. The people in surroundings were scared of the well-built men and wouldn't get involved in it. Hmm, let's do it in a classic way. "Sorry! I'm late, did you wait?" I barged in between the men and stood in front the girl. Since the girl was terrified and froze stiff in surprise, I thought the situation would turn worse were she to speak so I grabbed her by hand and tried to forcibly pull her after me. I sent Luka-chan a glance saying to go along with this act and received a nod in response. "Indeed. It's all because Myu-chan's been shopping at the store endlessly, the time to hunt will run out. Let's go." Luka-chan made a gentle and dignified smile, inducing the girl from among the men. The girl noticed our intention and shook her head so strongly it looked like it would come off. "Hey, wait. What, you've got some girl as friends. How about forming a party with us then." "Haa? Are you an idiot?" I spoke in a voice so cold I surprised myself. Because the men were clearly looking down on younger girls, my face cramped up and I wove words with a single breath. "There's four of you. Three of us. How do you want to form a party like this? Party's maximum is six people." She spoke implying, don't you know the system? "No, um... c'mon, hey you, leave party this time." "See, now there's three of us, let's make a party——"Yes, unfortunately we already have a party of six girls so there's no space. Farewell. "——"
Interrupting him, I was about to say "laters" and slip out, but the moment I turned my back to them one of men stretched his hand. Luka-chan and the girl squeezed out a scream, but it was no problem. *shh*, I dodged to the side and the man plunged forward. I've been leveling until a moment ago. Unlike those guys who try to hit on girls without raising their levels first. "What? You can't even touch me and you call yourself strong? Really." I left the girl to Luka-chan and confronted the four male players. Ready for a fight, I avoided the hands extending to catch me with ease. Naive, compared to PvP it looks like they're barely moving. A cooperative attack of four goblins looks better than this. The male players tried to catch me and I endlessly avoided them. Confronting them as to show off to onlookers, I spoke loudly. "Aren't you mistaking real with the game? People strong in fights in real aren't necessarily strong in game." I waited until a certain system works. And, its effect had come into being before long. The mens' bodies turned into particles and gradually faded. "A special move against sexual harassment——【GM Call】. See you." 【GM Call】 is a way for solving problems players can't deal with, you call a game master who is the administrator of the game in order to solve the problems. When you use the 【GM Call】 the game master is notified of violations such as harassment, as well as receives bug reports for bugs found in game, and will deal with them. This time, the content of report was VR specific harassment. The situation where men are chasing after a girl has been judged as attempted sexual harassment, one of the onlookers must have waited so that they can use the 【GM Call】. Since everything went as planned, I smiled. After confirming the men disappeared, I returned to Luka-chan. "It's not 'I'm back'! What kind of reckless thing are you doing!" And even though I came back in splendour, Luka-chan got angry. Her eyebrows were gently raised. Not good, she's as scary as Yun-oniichan when he's angry. Though, that's a rare occurence. Just when I thought she's angry, now she makes a tearful expression. I'm really sorry! "Luka-chan, I'm sorry. But, I'm quite accustomed to this kind of thing." As I seriously apologized, Luka-chan made a surprised look. It seemed like she was surprised with me being accustomed to this, but the fact that I knew how to deal with it made it easier. "Rather than that, did they do anything weird to you?" The girl hiding behind Luka-chan responded nervously, calm down a bit. I thought. "No. It's fine, it's fine. We've acted of our own interest too." The girl who had twitched in response to my words was cute, like a little animal. While I thought so, Luka-chan spoke to her to calm her down. "It's all right. Myu-chan is a good person. Probably." I guess Luka-chan can't assert it completely as we don't know each other for long. I smiled wryly and told the girl my request. "Now then, won't you form a temporary party with us?" "Um... is it fine to decide so easily? You might not want to join a party." Unsatisfied by the girl's response for invitation to the stray party Luka-chan asked, but the girl responded more calmly than she had before. "With those people, I wouldn't be able to calm down. Also, it's just girl's, isn't it. Actually, I look forward to it." Please take care of me. The girl lowered her head as she said that, I proudly responded with "leave it to me". After rejoining Hino-chan everything went smoothly. Both Hino-chan and I have invited two players each to the stray party. "Well then, let's introduce ourselves. I'm Myu. My style is magic swordsman. I use light and recovery magic." "And I'm Hino. For weapons I use a hammer and spear depending on situation, I'm a physical attacker. In combat I fight from middle range as main." Take care of me, said Hino-chan. From here on it's the stray party's members introduction. "I'm Lucato. I choose sword as my main." "Umm, I'm Rossy. I chose fire magic." The girl I solicited and together with Luka-chan saved, mage Rossy. She looked fearful and not dependable yet, if she get's used to the game she should get strong... probably. "I'm called Nekoya. A scout with stealth, specializing in weapons like that of a thief or a bandit, throwing knives and claws." "I'm Milizam. My weapon is this hand axe and the shield." The people Hino-chan brought were close to being supporters, Nekoya and Lizam were full of confidence. Milizam looked somewhat forceful. The word "rebound" would fit her really well, she was uncoordinated but seemed like the type that would rush in energetically. Such players constructed their Sense builds and way of fighting for explosive strength, at the same time they tended to be picky with their party members. Hino-chan and I would have no problems matching her, but I'm worried Luka-chan and Rossy, as well as Nekoya might not be able to match the pace. "Now then, how about we head to hunt immediately?" I stopped Milizam who was about to suddenly head to combat. "No, we've got some people who just equipped Senses and are still with initial equipment, we need to buy potions as well!" "Haa? You're goin' to heal so it's ain't necessary." Certainly, I said I use recovery magic, but my position is that of a magic swordsman. Did she really get it? "Haa, I get it. I'll be the rear." In that case Luka-chan as swordsman and Hino-chan in the vanguard, and tank Milizam. For the rearguard the setup will be me and Rossy. Nekoya, naturally will be a hit and run. Thinking about balance it wasn't too bad, but how about you consult with us more! Even if the result would be the same, consulting it is part of the party's thrill! "Um, certainly Myu-san can use recovery magic, but by having both magic and items you can use advantages of each fully. So..."
Ohh, Rossy has gathered courage and spoke her opinion towards Milizam. I beg you don't go all useless here! I felt like screaming that. Hino-chan lowered her shoulders as well, but the god of salvation hasn't abandoned me. "Well well, don't use such threatening tone. Well prepared means no worries. We can just go and buy them right?" Milizam agreed unhappily. Nekoya said what Rossy wanted to say, and so we were able to replenish consumables in NPC's store. Other than that, we had a conversation about whether some should sell beginner's weapons and buy NPC equipment or retain beginner's equipment and save money, the opinions differed between members. 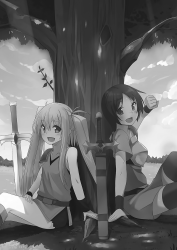 Rossy and Nekoya decided to keep using their weapons and save money, Milizam changed her axe and shield. "Hmnggh... there's not enough money. Choose whether you want attack or defence." Milizam pondered for a while. Well, I don't hate that kind of thing and I just talked with others as we waited. During this time, Luka-chan, Rossy and Nekoya could speak frankly with each other. "All right! I decided on an axe!" "Now then, let's head out for hunt. Once you reach a certain level Hino-chan and I will teach you about movements and characteristics of enemies!" Let's start by leaving through the closest, eastern gate. With that said, everyone started moving. After leaving the eastern gate, there were plains. On it, appeared Herbivorous Beasts which were said to be a tutorial for beginner's, on the vicinity of the boundary between plains and the forests appeared a little bit stronger mobs like Blue Slimes and Goblins. And on the field——players waited for mobs to appear. "Heyhey, there's no enemy to beat." "Whoops〜, We're late. Myu-chan, what do we do?" "Even if you ask me, this is troubling Hino-chan." In β era the player population wasn't that big so the hunting grounds weren't monopolized, but with the official version coming out one could expect a large number of people logging in on the first day. As the mobs were replaced, the party of six looked at the players crushing them right away and felt something very awkward. "It's different from the fantasy I dreamed of." "This is the tough life in game world." These were somewhat philosophical words from Nekoya-san because of which, Rossy was struck with reality. "Heyhey, what do we do. Like this there's no point in forming party." "Hmm. Either we wait until the hunting grounds open up, or we go to slightly stronger mobs where's less people, I guess?" "Then, we should aim for a place away from the town? Or one adjacent to this place." "What. So there's a good place. Let's go there then." "Wait a moment, listen to everyone's opinions!" As Milizam tried to move on alone I started persuading her, she responded defiantly but listened to me. "What Myu-chan said is ultimately just one possibility, we can head out to the west area to take a look and try hunting mobs gradually moving onto stronger ones. That's one method. I myself, would go to the west I guess. The experience gained isn't that good, but mobs relatively easy to defeat appear there." East had Herbivorous Beasts, Blue Slimes and Goblins. The mobs that appeared in the west were Wild Dogs, Bats and Forest Bears. Forest Bears appeared in a fairly narrow area in the southwest, so aside from that the enemies are weak. "Umm, this time Hino-chan and I are proposing this as support, you can decide it with a majority vote of the four of you." "East or west, is it." Luka-chan started thinking over the question deeply, Milizam and Nekoya decided quickly. "Moving is a pain so east's fine." "Hmm. Even though it's risky, we can raise our levels faster in the east, I guess." Milizam asked Rossy for opinion. "Um, I don't want to suddenly go where strong mobs are so wes... no, I don't mind either." "Alright! It's decided! One person abstained and two for the east. No matter how you struggle it won't be west, let's go!" Bringing Nekoya with her, Milizam immediately headed towards the eastern gate. Rossy looked with concern at Lucato who hasn't spoke her mind yet, but Luka-chan only smiled wryly as if to say it can't be helped. "Luka-chan, where did you want to go?" "Me? It was already decided by majority vote." "And that's why. You need to properly voice your opinion." "Fufu, you're right. There's still many things I don't know, so I wanted to go west." But, I look forward to the east side. She said with a soft smile. And then, we looked for a place with a few people, walking through the border of the eastern forest we found a suitable area. "Here, far away from other people we can start hunting." The location was on the south, quite near the Wetlands area. There were fewer people here because it was distant from the town. "Let's beat them right away!" Milizam assaulted a Herbivorous Beast nearby. And, Nekoya pounced on another one. Just, Nekoya seemed to struggle somewhat because of her low stats. "C'mon Rossy. He can't move now, you can aim now." A fireball produced from the staff's swing landed right on the Herbivorous Beast and dealt damage. Looking at that, seeing it's far from a proper party play Hino-chan made a wry smile and Luka-chan wondered when should she enter. "I'll pair up with Milizam, also support Nekoya and Rossy." "Then, I'll pair up with Luka-chan." With that said, while being taught about the Sense builds and enemies' features, Luka-chan strove towards leveling. In the vicinity of the area's boundary in addition to Herbivorous Beasts, mixed in were also Slimes. "Try managing your HP a little. ——《Heal》"
One person hit the enemy with the shield and swung the axe, completely ignoring defence. I used recovery magic on Milizam. Not just the Herbivorous Beasts that could be fought simply, she attacked the slimes from above as well. Seeing that, Rossy and Nekoya were motivated and switched to slimes which were easy to beat. "I know. Ah, my HP is low again! Hurry and heal me!" I defeated the slime that had its attention focus on Milizam by using 《Light Shot》 and healed her. Inadvedrently, I looked towards Hino-chan and Luka-chan. "The slime's nucleus is it's weakness. That's why, slashing the nucleus with the sword is most affective. In my case it would be smashing onto that area with my hammer." "Like, point, line and area attacks?" "That's right. Each mob has different characteristics like movements and weaknesses, if you know them you can fight them even despite level difference." Luka-chan listened to Hino-chan seriously. And, as I looked towards the two reflecting on combat, their movements were quickly getting better. I recalled at how at first I didn't know how to fight mobs and beat them up together with Hino-chan. "Alright! 【Axe】's level went up to 6!" "That's fast. I'm still at 4." Defeating each appearing mob, raising her level Milizam quickly went up to level 6. Nekoya and Rossy also steadily raised their levels. "This feels great! Let's beat Goblins next!" "Umm, I'm still level 3, I would like to stay here for a little longer." "In that case, the support can just focus on looking over the weaklings right? I want to level up faster." Saying so, she didn't intend to match the party's pace. Luka-chan's level was still low, but she focused herself on learning the player skills. 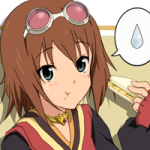 It meant she wasn't weak.. Hino-chan too had low level, but with her player skills she could take on Goblins. "...what do we do, Luka-chan." I asked Luka-chan. The reason Hino-chan and I have formed a stray party was in order to enjoy the atmosphere, there was no need to continue a party that didn't care about that. "I understand. Let's go further. However, let's take them down safely one by one." "Then, let's have a split of three each and follow up on each other. How about that? Me, Myu-chan and Luka-chan for one team, Milizam, Nekoya and Rossy for the other." Since the balance wasn't bad, Hino-chan's draft was easily passed. Pulling Nekoya and Rossy, Milizam proceeded forward. We have proceeded after those girls. Confronting a Goblin, Milizam's group defeated it while cooperating clumsily and each time they defeated one, they would use potions. "Tch, somehow it's not going too well. Support, recovery!" They defeated one Goblin, Rossy delivered the first attack, and then Milizam with Nekoya surrounded and defeated it. With Milizam assaulting, it felt like Rossy was unable to get a grasp on the timing to use magic. Although she requested recovery, before I could heal her she had already started battle with the next mob, her pace completely chaotic. "Goblin's weaknesses are it's neck and left of its chest. If you focus on those, they are easy to defeat." 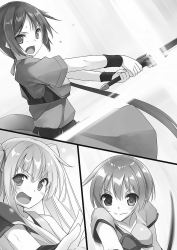 After saying so, Hino-chan hold down the Goblin with her spear's movements and Luka-chan took a strong lunge forward doing a thrust with the sword. With every blow aiming for the vitals, the time required to take down one Goblin decreased. Once used to it, one would naturally aim for those points or near them. Thanks to that, the difference between Milizam who just swung her weapon and Luka-chan who aimed for vitals had finally started appearing. And, once Milizam started having a hard time, she did something unexpected. "Meh! Taking them one by one feels sluggish! ——《Hate Bind》"
"You shouldn't do that here!" We have decided to take them one by one, haven't we. And yet, Milizam used 【Shield】 Sense's taunt-type skill. "It's fine! We need to secure an escape route!" Hino-chan brought Luka-chan and begun the retreat. In the middle of it we defeated the mobs coming at us. I had Nekoya and Rossy go ahead and took their place. And, Grey Rats and Mill Birds aimed for Milizam. She noticed them and with a creepy smile she had started swinging her axe. "Milizam! You won't make it unless you run!" "That's not it! This isn't the right place!" "If you're scared, just continue staying in support!" My persuasion didn't get through to Milizam. Even as she received damage, she continued to take down the incoming Grey Rats and Mill Birds with her axe. Seeing that, Rossy used her magic that improved with levels raised to defeat a Grey Rat that was away from Milizam. "Myu-chan. Why are you panicking?" "Because we're so far south, mobs from the south are mixed in. Mobs from the Wetlands should have been pulled in——here they are!" Attracted from the surroundings by the taunt skill, they jumped out from between the trees. It were the Moor Frogs, frog-type mobs. The moment I saw that, I moved. "What, a new enemy huh——"
Unable to finish speaking, Milizam was taken down with a single blow. Attacked by Moor Frog's tongue, her freshly recovered full HP was scrapped off. Seeing Milizam quickly fall despite the resistance, finally Nekoya and Rossy developed a sense of crisis, starting to run. I stood in spot and prepared for Moor Frog's pursuit. Now that Milizam who had gathered the most hate was down, the party had become the target instead. I took on the Moor Frog's pursuit with a light magic's wall, deflecting it. However, all I could is to deal with the Moor Frog, as for the remaining attacks of Grey Rats and Mill Birds I just endured it as I retreated. Rossy used her defensive magic and made a wall of fire between me and the enemies to hide me. Aiming for that timing I ran through all at once. As Hino-chan and Luka-chan defeated mobs on escape route, I just single-mindedly ran. "Moor Frogs alone went back!" "Then, let's defeat the rest. Hino-chan." After passing through its area, Moor Frog had returned into the depths of the forest. As the single mob who could wipe us out was no longer here, we started bullying the remaining mobs. I shoot an area attack I learned as my light magic leveled up, Hino-chan used her large hammer to hit the ground and cause a shockwave that damaged all the enemies on the ground. Hino-chan and I were able to defeat the mobs that approached us. However, because of magic's and art's delay time, we couldn't repeat the same action immediately. "Then, let's take them one by one! HAa!" "How nostalgic! Playing reckless with Myu-chan!" Together with Hino-chan we cut down the mobs as to protect each other's blind spots. Immediately judging which enemy attacks first, giving them an order we took them down. In order to seize initiative in the battle we crushed the enemy's initiative. Still, there was too much mobs for us to suppress, they have passed by towards Luka-chan and others. "Luka-chan, Nekoya! Hold them down!" In response to my voice, a shout along with a slash resounded. Using the short sword Luka-chan accurately tore through enemy's weaknesses, finishing them in a single blow. Also, in order to obtain initiative just like we did, she prioritized the mobs near her that have entered an attacking motion, defeating them in a good order. Responding to Rossy's support attack, Luka-chan sprung away from the spot. The fire bullet pierced through the dense group of mobs and took down a lot of them. Earlier when cooperating with Milizam, she would only deliver the first attack as they were wary of each other. Also she would shoot at mobs in the peripheries with her magic, Rossy herself looked surprised at the difference on how easy it is to find a spot to aim at. "Amazing. She's in the vanguard yet she has grasp on everything." Hino-chan didn't stop her hammer even as she watched Luka-chan's movements. Seeing Luka-chan's qualities I also spoke. "Want. No, I'd like her to join our party." I ended up saying "want" treating her like an object, but I have to definitely bring her in to our party. It was already decided. Meanwhile, Luka-chan also grasped Nekoya's movements, defeated the prioritized mobs and pulled back, allowing magic to strike the mobs. And she repeated that cycle consistently, she displayed high concentration without a sign of disruption. "This will be it! 《Light Web》!" The remaining mobs were wiped out with my area effect magic, then everyone sat down on spot. "No way, to think someone we partied with would try MPK'ing us. Moreover, she self-destructed." MPK - Monster Player Kill, an act of killing other players by using mobs. Even without Moor Frogs, with bad enough luck we would be taken down anyway. Thinking of that I felt like complaining, but no one had strength to do so. Since Luka-chan proposed that, we stood up and returned to the town. "Because of you guys I received death penalty!!" "Acting selfishly, were you trying to MPK us?!" After returning to the town, we met up with Milizam who returned after dying and spoke to each other. Milizam and I argued, it turned into a quarrel farewell. When leaving, she said something horrible. "It's all right, it's all right! Rather than that, how about we rest and then go hunt again? Earlier we have defeated lots of them so let's use that money to replenish items, this time let's go west!" After that, with the party still enveloped in slightly dark atmosphere, I tried speaking brightly. Adventure wasn't just defeating enemy, there were also stories and tricks useful for adventure, as we gathered certain items in an area and taught others, the atmosphere improved a little. And, the time to part has come. "Um, I'm sorry it turned weird in the middle." "N-no. We were helped and have learned about importance of cooperation!" "That's right. We learned a lot. Earlier, during the break I talked with Rossy, we decided to form a party together." It seemed like Rossy and Nekoya intended to form a party and adventure together from now on. They realized their player skill difference with ours and decided to catch up to us one day. So they said enthusiastically. "Thank you very much for today." "No, I had lots of fun today too! But, sorry. I was the one who brought Milizam." "Indeed. And, um... Luka-chan, if you don't mind, would you party with us again? Could you?" As I asked her giving her up-from-under look, she responded with a smile. "Understood. Then, how about tomorrow morning?" Great, got an appointment! I made a guts pose inside and today's stray party was disbanded. I thought about what happened today and about talking with Onii-chan, and about tomorrow as I entered the bath. "Mgrr, how do I invite her." The ability to grasp the whole party, calm judgement unfazed by the surrounding enemies. I wanted her as the party's commander no matter what. "Oh right. Let's ask her to try being commander!" I stood up from the bath, ignoring the hot water flowing down my body I got out of the bath. "Miu. Dry your hair so that you don't catch a cold." While listening to Onii-chan's concerns, I hurriedly dove into my room and sent Hino-chan a mail. "Strategy planning. Let's teach Luka-chan how fun is commanding, there." From there on we had a strategy meeting over mails, in the evening Hino-chan did high-speed leveling on a boar, preparing herself. "Myu-san, Hino-san, is it really here?" "Yup! Today, there's something I want Luka-chan to learn! OSO's real thrill!" Last night, after contacting Hino-chan, I consulted her on how to add Luka-chan into the party and as a result, we decided to do 【Golem-sensei】. "Where we're heading now, is the quarry area in the west. Also, the aim is the Golem, a boss mob." "Umm, I think I heard a disturbing word. Boss. Don't tell me we're going to defeat it now." "Wrong, wrong. The goal is leveling on Golem. We'll have Luka-chan use arts on it 100 times." High-speed leveling by fighting Golem. The reason we decided on 100 times for arts, was still a secret. "I think Luka-chan has an aptitude to be a commander in a party. That's why, give us orders." "Order Myu-san and Hino-san? You two have more experience, and it's impossible to hit something 100 times with arts." It was the case with fighting Golem as well, but hearing about 100 arts Luka-chan shrunk. "It's okay. We don't have to beat it. I said 100 arts, but you can just give us orders to make opening and attack then." "However, if we lose because of my instructions..."
"Oh, we're not ones to complain about such a thing." "I mean, if we move however we want, that's not being a party. It's a collection of soloers. That's why, we fight while putting absolute trust into commander. For the sake of the goal. So, it's for that sake! 100 hits with arts is the goal we aim for!" When successful, together with sense of accomplishment you get nice drops. I smiled while saying that, in response she made a puzzled expression, full of motivation. "I understand. I don't know if I can respond to your expectations, but I'll do it. First, I want to know what's Myu-san's and Hino-san's level and position. I'm thinking of confirming the roles." With that said, we have displayed out statuses to each other. Last night, Hino-chan leveled up with a sudden pitch and got up to a level recommended in order not to be taken down by the Golem with a single blow. However, with Golem that has a physical focus, Hino-chan's attacks will hardly work. In the party the one who could effectively strike the Golem was me and my light magic. "Myu-chan will attract it from the front. Hino-san will break its posture from behind. Can you please do that?" "Got it, Luka-chan, I'll do it." "In the β I beat up Golem with a hammer, so no prob!" She swung her sledgehammer lightly, showing her motivation. "And, I will hit it with arts when its posture is broken." Luka-chan said, is this way of doing this all right? But I thought there's no problem. "Now, let's begin! ——《Light Shot》!" A bullet of light was emitted and headed towards the Golem's head, I rushed out towards the front. In order to attract the Golem I used light magic several times in order to gather more hate, then avoided the swung fist. The wind caused by the swung fist sprinkled cold sweat off me, avoiding it my feet didn't stop even for a moment. And, with specific timing after the fist was swung up a several times, Hino-chan started running. Lowering her petite body, she approached the Golem's legs from behind. She did a full swing on its legs when it tilted its upper body to swing down its fist. There was a dull sound, but in contrast to that, there was no damage dealt to the Golem. Still, the knockback effect scooped it up from below and it fell on its back. Hino-chan ran through as not to be caught under the falling Golem, and as we passed by each other we did a high-five, doing something that roundabout we took distance and disengaged from the Golem. Luka-chan approached the fallen Golem. She stretched her back, concentrated while holding the short sword and released the art. With a step-in she let out a triple attack, but there was almost no damage, it left only a shallow scar on the muscle made of rock. Even though she showed disappointment for a moment, Luka-chan immediately recalled her original purpose and took distance from the Golem. Together with Hino-chan she chose timing for the next attack at her own discretion. "Myu-san, was it all right?" With that said, once again I let out a barrage of 《Light Shots》. This time the Golem tried to crush me with its leg, the moment it raised its leg Hino-chan rushed out and hit its pivot leg with a hammer. The Golem collapsed to the side raising a cloud of sand and Luka-chan let out an art again. The fact the scar left by 《Delta Slash》 had become thicker than before meant the leveling was effective. While combat became a simple task, Luka-chan had always taken a firm action. "Myu-san! Please retreat! It's movements are slightly off!" "Got it! Hino-chan, we're withdrawing!" Probably, it will be decided with Luka-chan releasing out arts around 30 times. I avoided the attacks and repeatedly gathered hate with light magic. Although it wasn't the Golem's decisive blow, I felt like we were fighting while making sure to maintain MP's safety margin, and then Luka-chan made a signal for withdrawal. We have withdrew from the battle with the Golem and returned to safety area. "Myu-san, are you all right?" My feet tangled and Luka-chan supported me immediately. "Sorry. Looks like I'm a bit tired." While I didn't notice, it seems like I've hoarded up quite the mental fatigue. The continued oppressive feeling from the bodily disparity, nervousness continued for a long time, exhausting my concentration. "Myu-san, please rest. Hino-san and I will continue alone." "Well then, we'll be going." Hino-chan switched her weapon from a hammer to a long spear and confronted the Golem. Because we have left combat once, the Golem had completely recovered. Hino-chan repeatedly attacked it from medium range with a spear to restrain it and gather hate. Looking for opportunity as Hino-chan attracts the Golem's attention to her, Luka-chan waited for the delay time to pass and when she could, she used the 《Delta Slash》. "Luka-chan. Hate shifted your way!" "Understood! I'll focus on avoiding." A long spear didn't deal much damage, so after Luka-chan used arts several times, the Golem's target changed to her. With the target changed from her, Hino-chan changed the weapon from the spear to hammer and attacked the Golem's back. The hammer swung up from above delivered the impact to the Golem's insides. If 《Impact》 is a simple physical attack art, 《Break Hammer》 is an art that has an effect of decreasing enemy's defence. "You won't be able to ignore me with this. ——《Impact》!" In response to the strong attack after having its defence decreased, Golem plunged forward. After this series of actions, the target returned to being Hino-chan. "If I attack immediately the target will change back to me, please bear it!" "Well then, I'll switch back to spear and adjust the damage." Once again she switched the weapon from a hammer to long spear and pulled the boss to herself and Luka-chan decided to use arts. I don't know how many times she used arts, but Luka-chan's movements have gotten quite good. "Hino-san. About time we took a break." Since we started with Golem leveling quite a long time has passed. As expected, both Hino-chan and Luka-chan were tired. "You should've used arts about 50 times?" "Just earlier was the 61st time. Also, my level rose extremely fast." Luka-chan dutifully counted them, and then she showed her stats which grew with leveling. Since she didn't receive any attacks, rather than 【Physical Defence Increase】 and 【Armour】 that are defence-type Senses didn't raise and since she didn't receive any damage neither have the 【HP Increase】 nor 【Stamina Recovery】. It was speed-leveling made to meet specific conditions, the speed itself was quite slow compared to confronting a Big Boar alone and it was very extreme. And, after a break we challenged the second part of the battle in perfect state. "Myu-san, Hino-san, why are you playing this game?" During the break in Golem's leveling, Luka-chan asked. "Because I wanted to meet Onee-chan, I guess." "That's right, I can meet Onee-chan who lives far away. Also, I love games." "I love games as well!" Hino-chan and I hit it off as kindred spirits who love games. "And, why did you start playing OSO Luka-chan?" When I asked in response, she embarrassedly faced down and replied in hoarse voice. "I mean, I love fantasy." "I love it as well, fantasy RPGs." When I asked her why is she so embarrassed, she said it's something else. "What I love, are fantasy novels." "Like, light novels? I read them sometimes as well." Just like Hino-chan, I read manga and stories based on games as well as walkthroughs, but other than that I didn't read too many books. I see, that's certainly different. I was convinced. "No, if I were classify them, I'd say they're fantasy literature." Given examples, like ones that were turned into films like story about the famous ring or about the magical boy, I finally understood. "And, um. For a long time I read things like that and about mythology, then I wanted to try it myself and started playing." Probably embarrassed, she faced down lower and lower to hide her face. What's this, dignified Luka-chan turned super cute when embarrassed. I felt like instinctively embracing her. I want to pull more of her story out and enjoy her embarrassed appearance. "Hey, Luka-chan, which parts do you like?" "No, um, like a hero boldly attacking the enemy's large army or dragon extermination and such." When I moved in the direction she was lowering her head down, she blushed even further and looked opposite direction. It was surprising that Luka-chan who was growing smaller right now had a desire to become a hero. 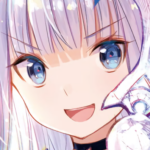 Just when I thought of moving again to look at her face, Hino-chan stopped me. "Myu-chan, don't tease her too much." "But, her reaction was so cute I ended up... sorry." It seems like Luka-chan calmed down a bit as she replied normally. However, her face was still a little bit red. "Then, was the world of OSO like you expected, Luka-chan?" "Yes, just like I expected it to be. No, even more fun than that." Luka-chan made a broad smile in response to my question. Yeah, she's enjoying it. Thinking so, I got motivated as well. "Alright! Now then, break's over! Let's have another battle with Golem!" Matching my momentum Hino-chan raised her fist, Luka-chan smiled bitterly. "Myu-san, rearguard. Hino-san, will break its posture with hit and run attacks. I'll stand in front." "...got it. We'll follow Luka-chan, the commander. However, if Luka-chan falls, we'll follow right after." Hino-chan froze not moving an inch, but I thought that Luka-chan wants to stand in the front. Possibly, seeing us stand in front of the Golem as we fought it, we might have looked like fantasy heroes to her. "Now then, let's go. ——《Delta Slash》!" Luka-chan let out art on the Golem's left leg. And, with the first attack the Golem's target was directed towards her. In a position near the Golem's left leg, Luka-chan avoided Golem's attack by moving counter-clockwise. Luka-chan who continued to look at us as we confronted the Golem had firmly analysed our movement patterns. The Golem's timings for swinging his arms up and around, as well as leg's attacks were grasped perfectly by her. That's why, whenever she saw the attack she was able to position herself on the left side and use arts after avoiding attack. As Luka-chan leaped away, Hino-chan approached the Golem all at once as it did a large swing. I matched the intense swing scooping Golem's feet and shot magic towards the Golem's head. The Golem fell sideways. Luka-chan who took distance, leaped back in this time, approaching all at once and let out an art towards the head part of the Golem. Three times, even as she let out arts, the Golem slowly stood up. It wasn't all that damaged by our onslaught. The Golem who got up turned towards Luka-chan and swung its right arm sideways. There would be no time to avoid counter-clockwise after the set amount of time an art used. Looking as the Golem's arm approached Luka-chan, Hino-chan screamed, but I believed in her. "Another one, she's got guts." Luka-chan was unable to avoid the right arm cleave coming counter-clockwise, but she properly found a safe area. She slid below Golem's legs and moved behind its back, after that she let out arts on its left leg and moved to the Golem's left side. "C'mon, I was about to get a heart attack." Hino-chan stroked her own chest. I too felt sweat in my clenched fist. In case she didn't make it I prepared the magic 《Light Shield》, but it was wasted. "This'll be the 100th time——《Delta Slash》!" The triple attack was engraved on the Golem's leg. At first, it were just thin scars, but now there was damage, although quite small. And, Luka-chan's expression changed from confused one, through surprise, to joy. "You two are so sly. Presenting such a surprise gift." "Then, for the last thing, use it on the Golem!" This will be the last part. Luka-chan who achieved the goal of using arts 100 times held the sword aligned with her eyes and choose the timing of the attack at her own discretion. HIno-chan delivered a nasty blow to the back of the Golem's knee and it fell diagonally on its knees. And, Luka-chan let out an art towards the looming, gigantic rock arm. The sword held in both hands blew away the Golem's huge arm. Just like that, the Golem fell on its back. However, we weren't able to cut down even 10% of its HP in total. The reason I presented Luka-chan the target of 100 arts uses. It was a method of obtaining new arts, it was a way to raise the level and fulfil the specific conditions! Suitable for fulfilling the conditions for those two arts. She would eventually received 《Fifth Breaker》 as she leveled up, but it was an easy-to-use art. 《Shock Impact》 was a sword-type art that had a strong blunt attribute, it was effective against enemies with high physical defence like Golem and against weak enemies. In the β era, there was a way to get arts by using Golem and since the conditions for acquiring the arts was similar, it was an arts teaching course by using Golem-sensei. That was the reason behind the nickname 【Golem-sensei】. And in the end, we revealed the story to Luka-chan. "——And so, Luka-chan was able to get two arts. Congrats." As I congratulated her with Hino-chan, Luka-chan made a happy, embarrassing smile. "Thank you very much. Myu-san, Hino-san." It had to be said with this timing. We nodded at each other with Hino-chan and spoke together.
" "——Luka-chan, please form a party with us!" "
Hino-chan and I asked while lowering our heads. After a moment of silence, a quiet laughter could be heard and we slowly raised our heads. "Really, it makes me want to take revenge on you two." "I'm still inexperienced, but please do take care of me." Luka-chan stretched her back and deeply lowered her head. She consented on joining our party. "However, even after so many hits with arts, we only took down 10% of the Golem's HP." "Should we take measures against that immediately? In order to take down the Golem." As to encourage Luka-chan, Hino-chan clenched her small fist and tried to decide what to do from now on. "What we're lacking are level's right, also equipment." "I'm sorry, I have no money." "Then, first let's do some leveling and securing money." Since we decided, let's hurry and go! While compensating defence that was ignored in the extreme training with Golem-sensei, let's look for a way to get money! "Golem! Wash your neck and wait! We'll definitely take you down after we get stronger!" I declared while pointing my finger at it. Together with Luka-chan and Hino-chan we'll get stronger. However, securing money comes first! In order to acquire new equipment! Thanks for the chapter, just got around to reading it and I love this series as usual. Here's hoping it gets a volume release at some point so it can be tracked on MU easily. Otherwise, I appreciate your translating. Actually it's tracked as a volume of the original series, if there's volume 2 of Myu's volume, I'll put in a request to make a separate series out of it. There were plenty of signs that she was Leroy Jenkins, they only have themselves to blame for actually going into the wilderness with someone like her. I can't help but think that Myu should have been using Magic Recovery. It would definitely have been getting XP from this, is a very useful skill to have for long fights of all sorts and Armor was pretty useless to have equipped since the Golem could one-shot her even with it on (unless I was misunderstanding something of course). Too much pickup behavior these days is just disgraceful, and the more desperate a male subset gets the worse their propriety becomes. While I'm interested in hearing the answers to the above questions, mainly I'm just grateful for another OSO story chapter! Thank you once again Krytyk. In other novels that Milizam girl might have become an antagonist in future volumes, but in OSO... not so sure. Probably a random small fry. Nah, no one would party with her, after having her in the party once. Reason being she nearly MPK-ed the party, and how impulsive she is, just rushing ahead. So she'll probably quit after awhile. I'd thought that with magic Senses you got 1 spell at the beginning, then one more each 10 levels. Yet here she's got level 8 light element talent, and uses Light Shot, Light Shield, and Light Web. Am I forgeting something, or is it just different for Light element? Although I suppose it might be that Shield was acquired at 5, and Web is one gained by usage. Also, I'm wondering if 1 Shield Sense user + 5 magicians would work. Use the taunt skill to pull loads of surrounding monsters. Nuke the hell out of the area with 5 AoE spells. In the main volumes I seem to recall that some spells can combine for extra damage, so it might be good. the spells would be similar to what they did for luka-chan I assume. meet conditions to unlock more. plus we don't know how many they would start off with in every type, but since recovery and light are separate she would have 2 spells + unlocks. the shields sound like a type you can unlock shortly after you pick up the sense so as to have a form of attack and a form of defence. As for the shield + 5 mages, it would depend I guess. mages are often DMG heavy and it can be hard for a shield user to keep all the hate, if even 1 slips passed the mages are in trouble. In OSO this can be settled with special builds but would be a very unbalanced party. Suppose they meet any mobs who have high magical resistance they would have to give up on it entirely until they are much higher level than normally needed. often why the "typical" 4 man party build is often, warrior +priest + mage + ranger, to cover all bases safely. variants are more effective depending on the types and people but with a 6man limit you have quite a few combinations that would prove much better than the shield +5mage set-up. Uh, is it just me or are Luca's before golem and after golem stats unchanged? It wasn't just him. It seems that it was corrected later. I also had both of them being the same. Go go Luka-chan! Thanks for the chapter. "Aren't you mistaking real with the game? "Aren't you mistaking reality with the game? -> hm... just asking, but didn't you actually mean "frightened" instead of "fearful"? ..., her pace completely chaotic. ..., her pace is/was completely chaotic. An action that gathers hate from the mobs in surroundings. An action that gathers hate from the mobs in the surroundings. We need to secure escape route!" We need to secure an escape route!" ..., with bad enough luck we would be taken down anyway. -> maybe change to "with much misfortune" ? "Because of you I received death penalty!!" "Because of you I received the death penalty!!" With that said, once again she let out a barrage of 《Light Shots》. -> shouldn't it be "I let out a barrage" since it's Myu who used that Skill? "No, um, like a hero boldly attacking enemy's large army or dragon extermination and such." Luka-chan who took distance leaped back in this time approaching all at once and let out an art towards the head part of the Golem. -> maybe add a comma after "leaped back in" for better readability? Testing: For some reason I keep getting a duplicate error when I try to post. Weren't bats and wild dogs nocturnal? And whoa, west side somehow sounds tougher then the east. There seems to be a mistake on Lucato's displayed senses; for the second one, it displays the same levels as the first, even though she said that she leveled 'extremely fast'. Anyways, what happened to the delay for skills? Lucato seems to be able to keep using [Delta Slash] repeatedly, within a short time-margin after the rest. Yeah, it seems somehow it reverted back... no idea. Prob my sleepiness. Fixed.